Inspector Harry Callahan (Clint Eastwood) is back for the third of his initial three adventures, and now he faces a triple threat: a band of anarchists intent on blowing up San Francisco; smarmy politicians; and creeping gender equity policies that translate into an inexperienced female officer being assigned as his partner. The Enforcer is polished and satisfying, but it is also the most straightforward of the initial Dirty Harry movies, the series settling into a mostly predictable routine. Harry's criminal adversaries in this episode are the least developed and most forgettable: a mishmash of generally faceless youth who get their hands on sophisticated explosives and weaponry and hold the City to ransom. Their leader, an unhinged Vietnam War vet, is hardly given any back-story, and is almost relegated to another generic bad guy who needs to be dispatched. The entire main plot appears contrived to end with a climax, filmed at Alcatraz, that allows Harry to fire an anti-tank LAW rocket, his Magnum handgun no longer considered a sufficiently large gun. Callahan's continuous friction with his superiors is also a regurgitation of the first two movies. The Enforcer adds a minor twist by dropping the Mayor personally into the danger zone, forcing Harry to save a politician that he despises. The introduction of Tyne Daly as Inspector Kate Moore, a smart but green officer foisted upon Callahan, could have been handled with more subtlety, but director James Fargo jackhammers in all the stereotypes, with Moore the subject of utter and open disrespect until she proves herself. Regardless of her abilities, The Enforcer does increase the already remarkably high mortality rate of Callahan's partners: he loses two in this film alone. The film suffers from a lackluster supporting cast, Daly joined by cop movie stalwarts Harry Guardino and Bradford Dillman as they stand anonymously in Eastwood's long shadow. The struggle to keep the character fresh is evidenced by four screenwriters wrestling with a script that rarely rises above the adequate. 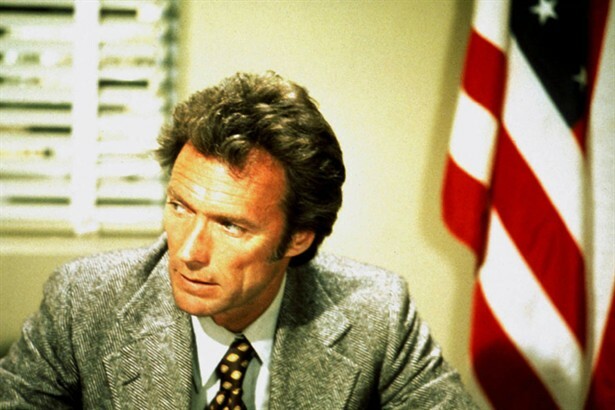 Dirty Harry was never going to settle for average, and he wisely took a long break after this outing.